OKLAHOMA CITY - The Los Angeles Dodgers and Oklahoma City Dodgers have announced the 2019 OKC Dodgers field staff, led by new manager Travis Barbary. Pitching coach Bill Simas is the only returning staff member among the four on-field coaches. Hitting coach Scott Coolbaugh and coach Jeremy Rodriguez each will be joining the OKC Dodgers for the first time. Barbary is Oklahoma City's 33rd manager during the team's 58-year history as a Triple-A franchise. He is entering his 25th season in the Dodgers organization as a player, staff member or coach, including the last 12 years as the organization's catching coordinator. Barbary previously served as a hitting coach and manager in the lower levels of the Dodgers' farm system, with four total seasons managing the Rookie-Level Ogden Raptors (2003-04) and Low-A Columbus Catfish (2005-06). From 1998-2001, he was with the Los Angeles Dodgers as a bullpen catcher. Originally from Easley, S.C., the 47-year-old Barbary played collegiately at Spartanburg Methodist Junior College and the University of Virginia. The former catcher spent one season playing professionally in the Dodgers organization in 1994 before transitioning to coaching. Simas enters his ninth season as a pitching coach in the Dodgers organization and his second consecutive season at Triple-A. Last season, Simas' pitching staff in Oklahoma City ranked second in the Pacific Coast League with a 3.92 ERA and tied for the fewest home runs allowed, helping the team to a 75-65 regular-season record and an American Northern Division championship. Simas has spent his entire coaching career in the Dodgers organization. His previous stops include the Rookie-Level Ogden Raptors (2011-12), Low-A Great Lakes Loons (2013-14), High-A Rancho Cucamonga Quakes (2015) and Double-A Tulsa Drillers (2016-17). Prior to coaching, Simas played professionally for 16 seasons, including a six-year run as a reliever for the Chicago White Sox between 1995-2000 and made a total of 308 appearances. He spent the 2003 season in the Dodgers organization, primarily at Triple-A Las Vegas. Coolbaugh enters his first season as a coach with the Dodgers after spending each of the last four seasons as the hitting coach for the Baltimore Orioles. In each of his first three seasons, the Orioles ranked in the top five in the Major Leagues in home runs, and in 2017, the team produced seven players who hit 20 or more home runs for just the second time in team history. Before joining the Orioles, Coolbaugh spent eight years in the Texas Rangers organization in various capacities, including two seasons as the Major League hitting coach. Although Coolbaugh is new to the Dodgers organization, he has previously coached in Oklahoma City, serving as hitting coach with the RedHawks in 2009 and 2010 when the franchise was affiliated with the Rangers. Overall, Coolbaugh has been coaching within professional baseball for 18 seasons. He played professionally for 13 years, including a total of 167 games in the Major Leagues between the Texas Rangers, San Diego Padres and St. Louis Cardinals. Between 1989-90, Coolbaugh appeared in a total of 220 games for the Oklahoma City 89ers. At just 29 years old, Rodriguez will be the youngest member of the on-field coaching staff. 2019 marks his fourth year in the organization as a coach, including as manager for Low-A Great Lakes in 2017 and Rookie-Level Odgen in 2018, where he led the Raptors to a Pioneer League-best 46-30 record. Rodriguez will serve as the team's primary third base coach, work with the team's infielders and help install defensive positioning during games. Originally from Southern California, Rodriguez played professionally for five seasons in the San Diego Padres organization. 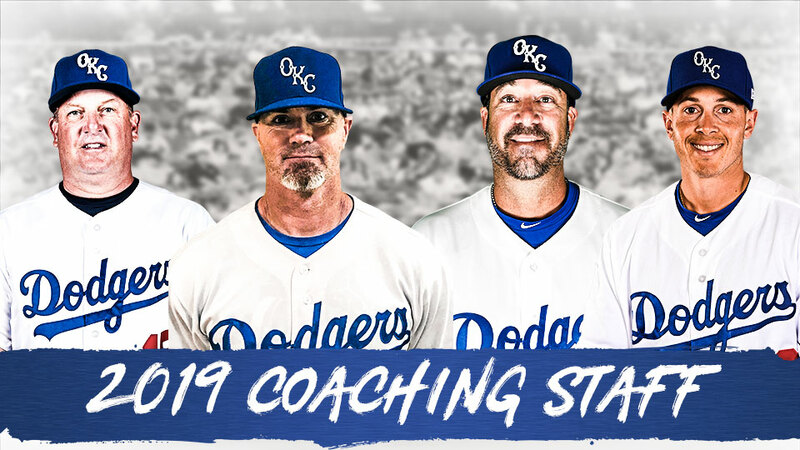 Among the other staff members, Performance Coach Tyler Norton returns to OKC for a second consecutive season and his seventh overall season in the Dodgers organization. The team's athletic trainers are Shawn McDermott and Vic Scarpone, both of whom are new to the organization. The OKC Dodgers open the 2019 season at Chickasaw Bricktown Ballpark Thursday, April 4 against the San Antonio Missions. Ticket packages and group outings throughout the 2019 season are now available and can be reserved by calling (405) 218-1000 or visiting okcdodgers.com.